Do you know the recent online trend that dominates the financial strategical discussions? It’s none other than the data protection over multi-cloud architecture! Today in this CloudCodes official post, we are going to cover multi-cloud security challenges and suggest financial institutions that how they can overcome them. What Excites Financial Firms to Work Online? Financial institutions are understanding the pros of multi-cloud technology in aspects of flexibility, storage, scalability, and annual savings. According to KPMG, shifting the offline work on cloud storage provides the benefit of 30 to 40 percent of savings in banks. This results in rapid growth of cloud computing technology adoption, specially in financial services companies. They are enforcing multi-cloud strategies with the expectation of adding a redundancy level to their online service usage. This entirely translates the ability to meet clients’ expectation, reduces spending of waste money, and ignore unnecessary lock-in with cloud providers. Shifting of offline work to the cloud means that financial records are going to be stored on the off-site servers instead of getting stored on traditional storage platform under complete supervision of financial IT team who is responsible for implementing business-based security controls. Valuable kind of data is managed by the financial service companies, which is actually a lucrative target for internet hackers. With the perspective of maintaining an effective financial Cybersecurity architecture, companies have to consolidate their number of cloud security controls into a single comprehensive architecture. This infrastructure should be the one where consistent security standards could be enforced and also, easily managed from a single place. Unique Portal – This might be shocking for you that ‘One of the biggest advantages of a multi-cloud platform is the greatest security challenge.’ Multi-Cloud permits financial companies to deploy the platform for each and every core organizational app, but doing so, appends n number of management complexity layers. Managing uncountable numbers of layers is one of the biggest multi-cloud security challenges. Every service provider deployment arrives with its own set of unique portals and accesses that organizations need for management purpose. Imagine that even few things as apparently simple as IAM could be complicated if different vendors require variations in authentication measures or password complexities. Solution – The solution of this security risk is to adopt a multi-cloud management software, which brings unique resources under one single umbrella. It will help in avoiding problems of managing several layers and provide an easy-to-use interface for holding the things. Financial institutions should adopt a multi-cloud monitoring platform from where they can supervise their employees’ regular work, and keep a constant eye on crucial resources. 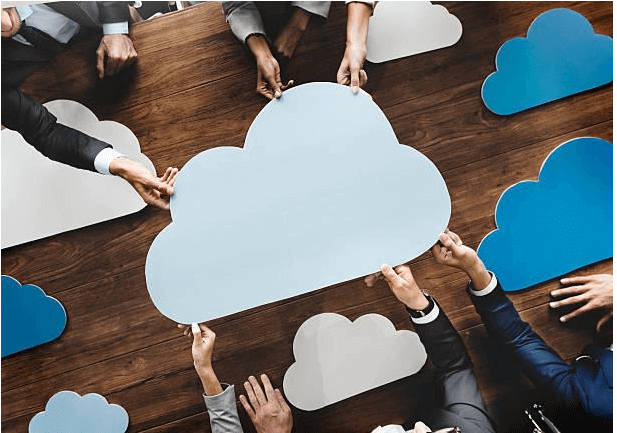 Gap in Cloud Skills – The exponential increase of Azure and AWS have huge requirement for administrators and architects who have masters in these platforms. In fact, AWS certified IT executives are demanding a 28% hike in their salary than their peers. Affording employee with a high salary is not always possible for financial institutions, which again leads to another multi-cloud security challenge. Solution – Organizations searching to harness the multi-cloud platform as the main pillar of their strategy must have security certification experts in their premises, and be mentally prepared with essential investments. These investments demand to appoint a cloud security-as-a-service vendor who provide an automated solution to prevent data from leakage or cyber threats. Data Compliance – Data security standards like PCI DSS, FISMA, SOX, HIPAA, etc., are present in today’s date to secure customers records in financial institutions. For most organizations, several compliance requirements enforce some or all of their content – and these demands appear on the cloud. This results in ensuring of particular vendors who have the capability of meeting compliance requirements before using them in multi-cloud architecture. Owners of financial companies have to make sure that vendors satisfy the compliance requirements and desire to agree to all core business associate or terms & conditions, or have faith on cloud service brokerage to address your best match. Things become easier to manage in companies, if automated software are available for the same. CloudCodes CASB vendor provides all protection controls through which financial institutions can overcome multi-cloud security challenges without any complications. The vendor provides its service at an affordable cost, and enables its customers to contact with support executive, if in case clients face any issue. Either through remote desktop connection or doorstep service, CloudCodes keeps its customers satisfied all the time. The security service ensures that clients will not face any Cyberattack or data breach incident due to CloudCodes automated solution. With this CASB solution, it is possible to gain 24*7 data protection upon core data of financial companies!